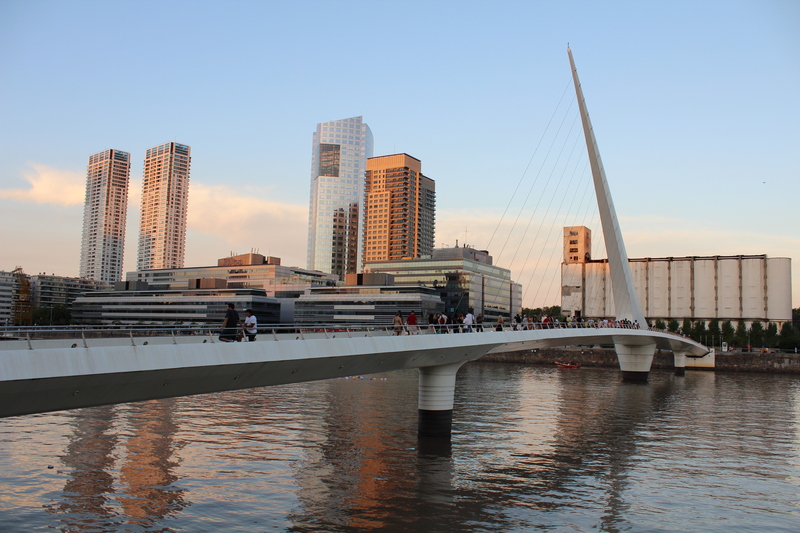 Puerto Madero is a really cool neighborhood on the eastern part of the city. 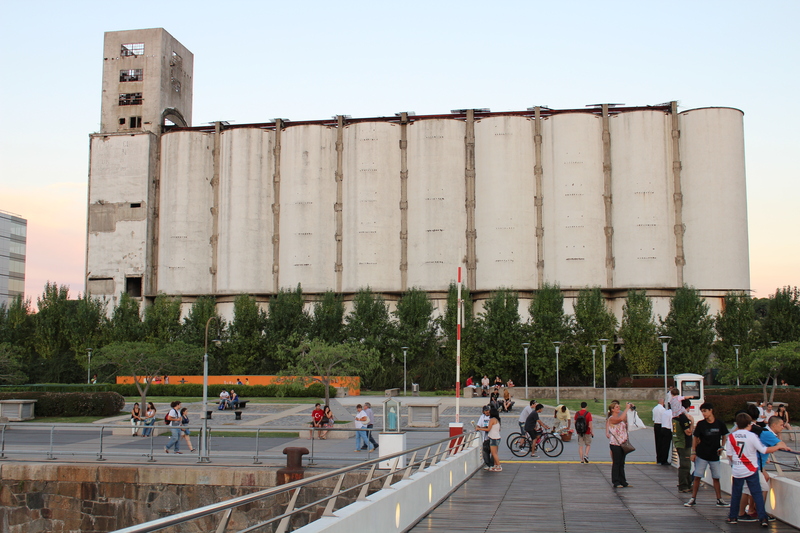 The neighborhood was originally constructed as a port for the city, but in the 90s, after many years of disuse and decay, it was renovated as a trendy neighborhood replete with large hotels, fancy restaurants and cafes, and a growing real estate market. It actually kind of reminds me of the Long Wharf/North End of Boston. The neighborhood itself is actually a little island connected to the mainland by several bridges. Through the center of the neighborhood runs a canal that is filled with boats, a couple tall ships, and a floating restaurant. 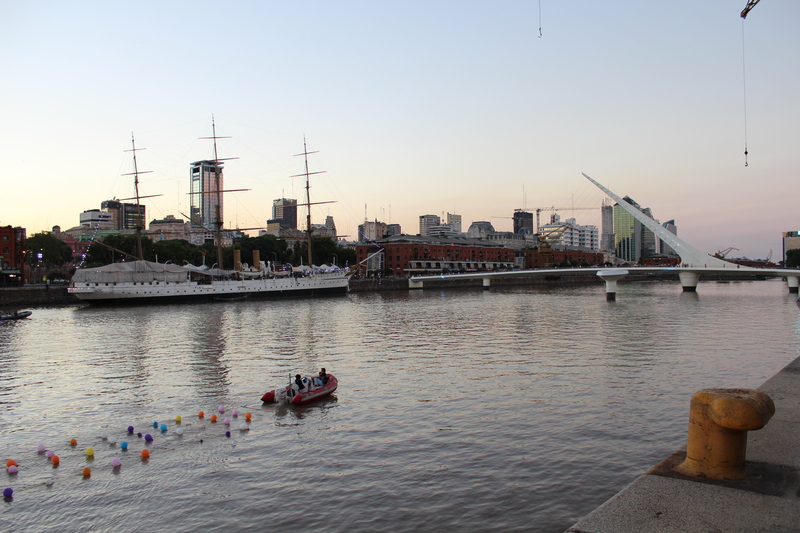 A friend and I went to Puerto Madero on Valentine’s Day in hopes of participating in a One Billion Women Rising event. Unfortunately the times on the website conflicted with the Facebook page time and we missed the event. But we got to experience the neighborhood at the best time of night. Also, as you can see, there was a boat dragging around balloons in the river. I’m not quite sure what that was about, but I imagine it has to do with St. Valentine’s Day. 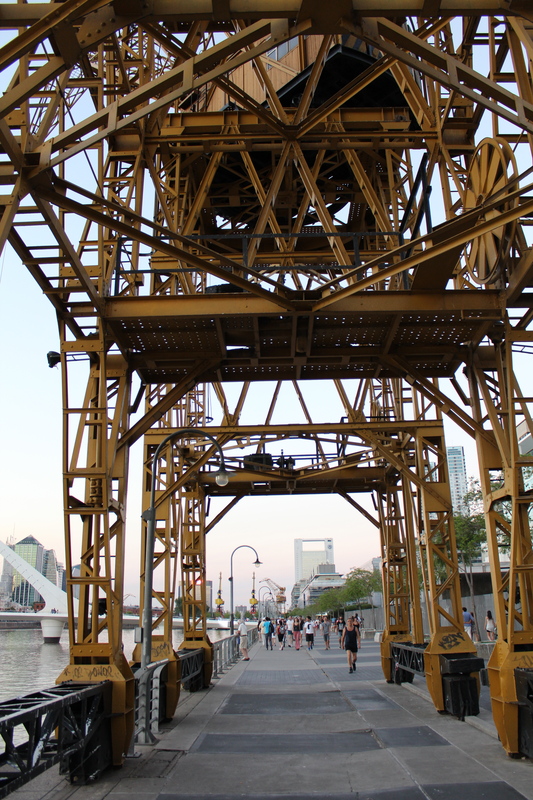 There are still some old cranes scattered across Puerto Madero. I don’t think they’re functional anymore, but they certainly do add a bit of history to the neighborhood. Linking the east and west docks are several bridges with the newest Puente de las Mujeres (Women’s Bridge) standing out as a modern and beautifully designed walking bridge. Built in 2008 the Puente de las Mujeres unifies the focus on important women that resonates throughout the neighborhood as all of its streets named after women. El Puente de las Mujeres. 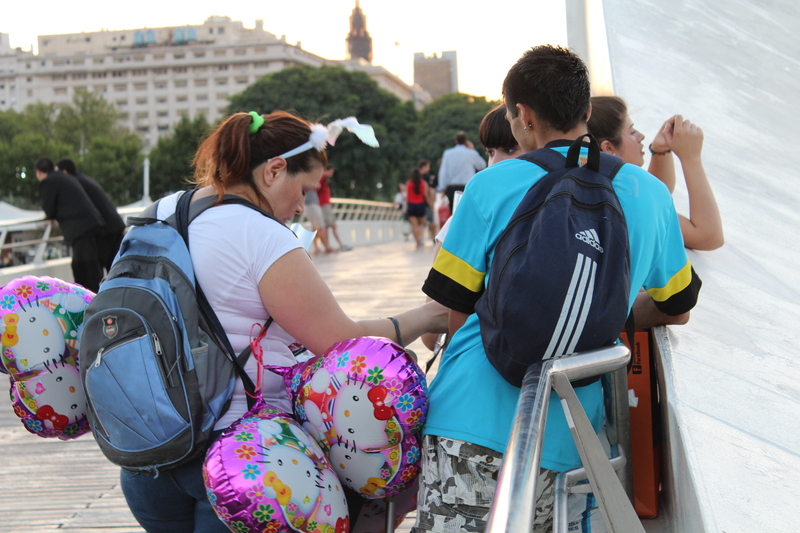 A girl sells Hello Kitty Valentine’s Balloons on the bridge. 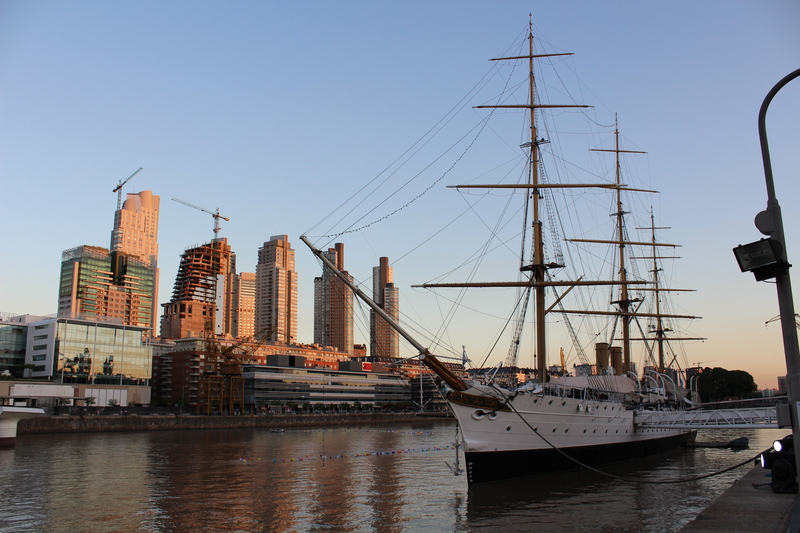 Puerto Madero is really a beautiful place to walk around during the day or evening, but particularly at sunset. After a beautiful pink sunset, the lights of the neighborhood, the Puente de las Mujeres, and the tall ships create a really magical tableau, almost out of a painting.